As the “First Choice of First Responders”, L-3 Mobile-Vision understands the importance behind the decision for your mobile video needs. In today’s digital age, L-3 Mobile-Vision produces a solution that essentially eliminates all manual intervention, from the capture of video all the way through transferring and storing it. The Flashback3 system is designed for agencies of all sizes in which we will work to understand all your needs in order to provide a solution that will equip your agency with the best technology possible. Records up to 5 cameras and 3 audio sources concurrently. Allows for searchability by location; sets system clock and synchronizes all department vehicles to actual/real time. Enables fast and accurate tracking of location(s) for evidence discarded during a chase sequence with new MAP IT! pinpointing capability from evidence management solution in the agency. Supports 802.11 (a/b/g/n), providing faster uploads of video and faster downloads of software updates. Removable SD Card available. 8-64 hours of D1 video. Encrypted hash on file using DVRs 1024 bit key for integrity and authentication. (DEP and DET Users Only) eliminate costly manual upgrades and ensure traceablity of all your updates. Supports full-frame pre-event recording for up to 60 seconds. It can simultaneously play and record from the same file while utilizing highly available SD Card for video storage. 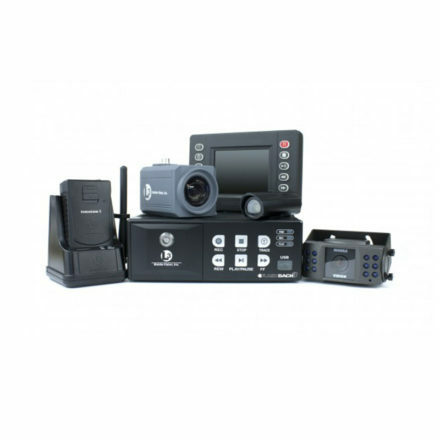 Turns on with lights, sirens, a configurable speed trigger or VLP2 wireless microphone. Requires only 1.5 amps and is equipped with an intelligent auto-off feature. Simple and easy to use USB key log-in feature. The ability to designate an incident (DUI, Reckless, Domestic, etc.) immediately after the incident is concluded. This classification (or priority level) is passed to the management solution in the agency where definable operational rules allow for the automated processing and categorization of specific classes of incidents.